Dadaism is an artistic movement in modern art that started around World War I. Its purpose was to ridicule the meaninglessness of the modern world. 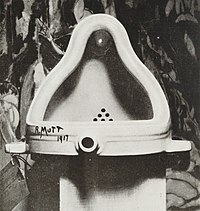 Its peak was 1916 to 1922, and it influenced surrealism, pop art, and punk rock. It favored going against the standards of society. Followers of Dadaism included Antonin Artaud, Max Ernst, and Salvador Dali. A later version, called Neo-Dada, arose in the 1960s. Dadaism began gaining popularity around Western Europe specifically in Berlin and Zurich. Dadaism eventually moved to Paris along with one of the "presidents of Dada", Tristan Tzara who would go on to "lead" the Dadaists of Paris. His Works include The Gas Heart, Handkerchief of Clouds, and The Bearded Heart. The final performance of The Gas Heart along with The Bearded Heart in 1923 was considered to be the beginning of the end of Dada. The performance was attended by such Dada artist as Man Ray, Jean Cocteau, and Marcel Duchamp. The Performance ended in a violent riot in which many of the attendants were injured. Dadaism is also closely associated with the concepts of the grotesque, the absurd and the macabre that were communicated through the arts slightly later in the twentieth century. The idea of ridiculing the absurdity of existence finds its most poignant expression through the dramatic art of Samuel Beckett and the so called Paris school of dramatists that included Arthur Adamov, Jean Genet, and Eugene O'Neill. The name itself is reflection that the art was designed to seem meaningful when it is in fact a reflection of how overvalued societal norms and expectations had become. The word "Dada" in and of itself has no meaning. This page was last changed on 8 April 2019, at 18:38.